May | 2010 | I made that! I just can’t hold this one back anymore. 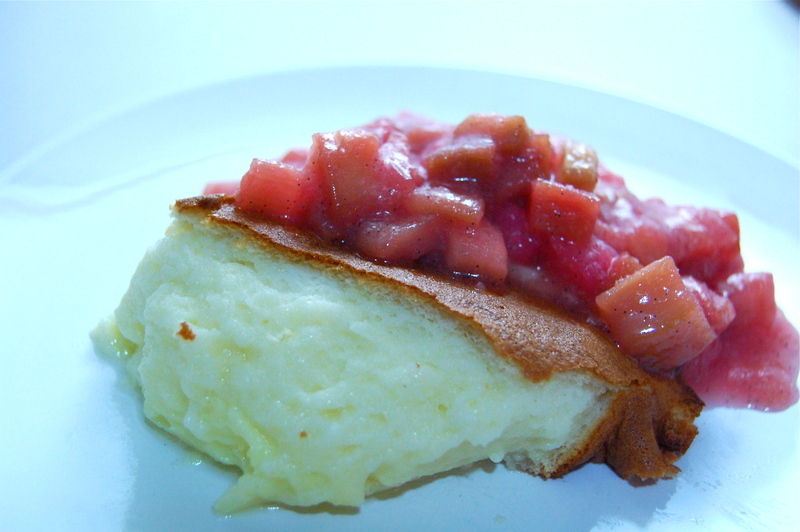 I decided months ago that I wanted to make rhubarb shortcakes for Delancey’s dessert menu. I had a decent recipe for rhubarb compote from my old job, but I knew I could make it better. Me and Molly compared our favorite compote recipes and came up with an ingredients list that was pretty killer. Think vanilla bean. Sugar. Orange liquor. Butter. You toss all these things together and let them sit and get all juicy. Then you roast them until they soft and bright. And this is where the magic happens. 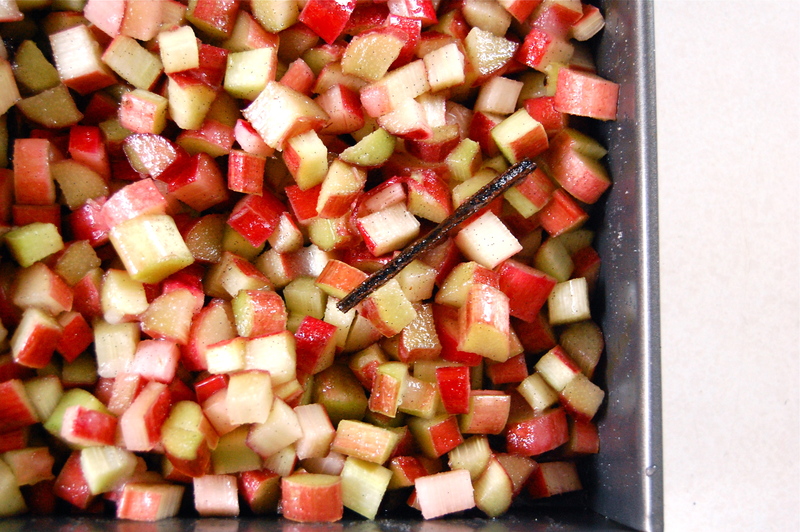 Strain out the liquid from the rhubarb and set the chunks aside. Then reduce that liquid into a nice syrup. This concentrates the flavor to the point of extreme rhubarb deliciousness. As my friend Meredith at Delancey said “It’s more rhubarb-y than rhubarb.” And that my friends, is what I’m talking about. We serve it with flakey shortcakes and mascarpone cream. At home I eat it with buttermilk souffle cakes. The world is your base to put rhubarb on. – Slice open the vanilla bean and scrape the seeds into the sugar to break up clumps. – Combine all ingredients, including vanilla bean pod, in a baking pan. Stir well and let sit for 30 minutes. – Divide into 2 batches and cover pans with aluminum foil. Bake at 325 for 30-40 minutes. You want to cook it long enough for the fruit to still hold it’s shape, but to start to break up as you stir it. At this point remove one pan from the oven and set aside to cool. – Continue cooking the other pan for 10-15 more minutes, until the fruit turns a brighter shade of red and breaks down more easily. Remove the 2nd pan from the oven and set aside to cool. – Strain out liquid from both pans into a saucepan. 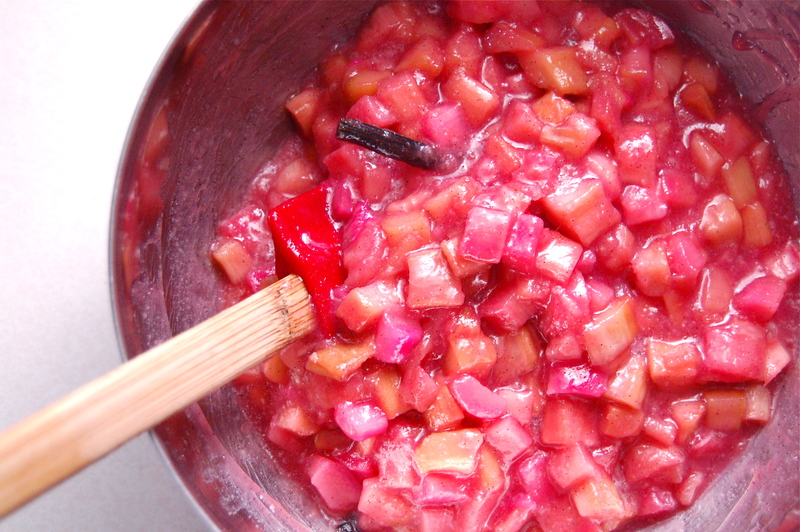 Place rhubarb chunks into a large bowl and set aside. 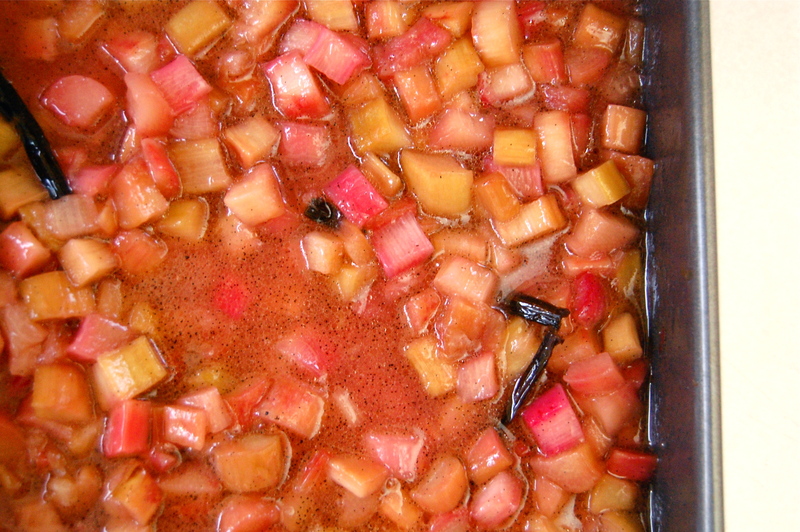 – Boil rhubarb juice over high heat until it is reduced to a syrup. Be careful not to burn. 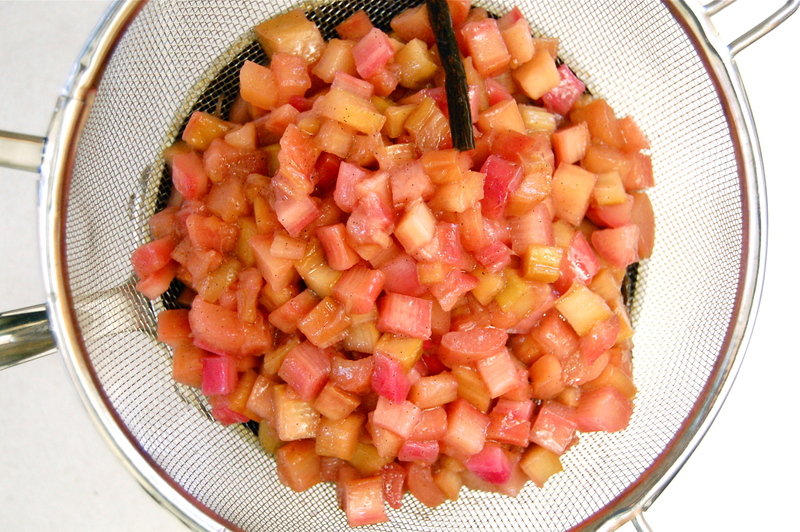 – Mix syrup back into rhubarb chunks. – Is best eaten at room temperature, but store in fridge. I know, there’s no excuse. The sad thing is that I actually have a stack (if digital files could stack) of photos from my meals this past month. I just haven’t found the motivation to park myself in front of the computer and look at them. Or write about them. There’s been delicious pasta, a rhubarb compote that feels like there’s a rhubarb party in your mouth, an all roasted Easter dinner. I’ve even been maniacally documenting my garden, to explain my away time. But none has made it to the interweb. Until now anyways. My friend Justin was in town from Ecuador for his birthday. Recently he asked if I would someday make him a key lime pie, so me and his girlfriend Meredith decided a surprise pie was in order. Since I like to make my life more complicated whenever possible, I opted for a pie vs. cake challenge. Forever the defender of birthday cakes, I decided this was my chance to convince the world of cake’s subtle awesomeness. Unfortunately my key lime coconut cake kinda blew (shocking, I know! ), so I’m only going to share with you the pie. And what a pie it was. Key lime pie with coconut graham crust and a coconut whipped cream on top. Makes me miss living farther south where the key limes are actually green. 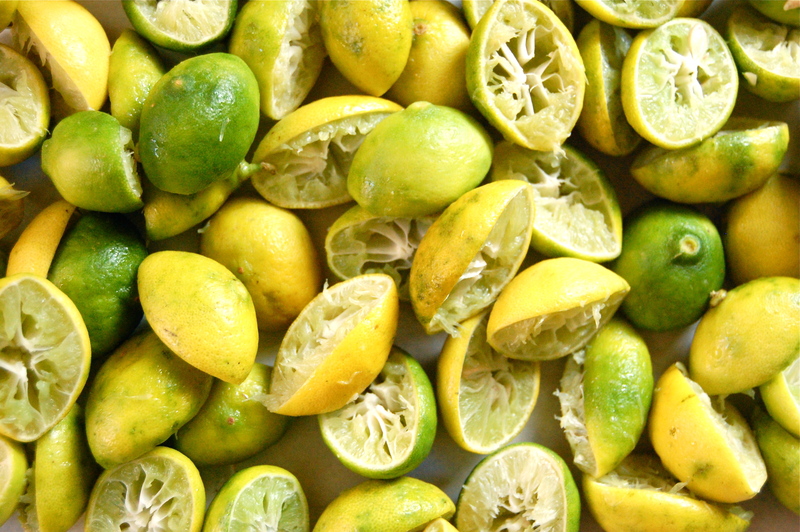 As with anything citrus related, there was a lot of squeezing. Now as far as desserts go, the key lime pie is definitely in the easy category. So easy I even considered not sharing with you. 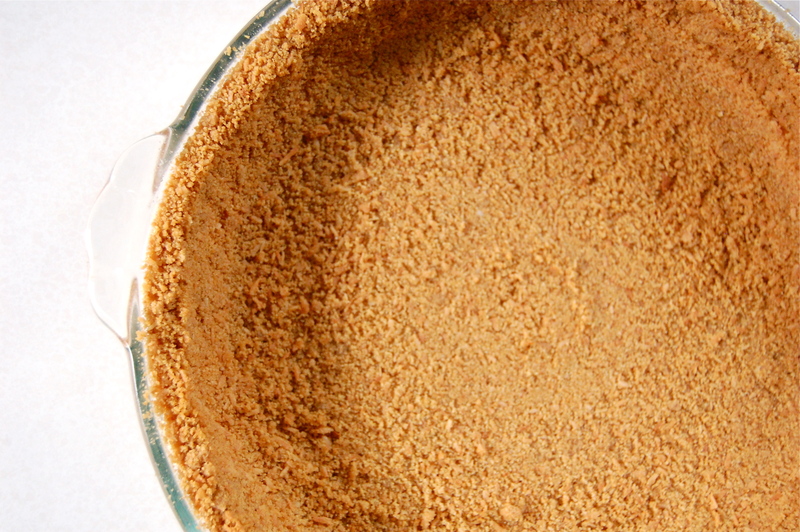 And graham cracker crusts? I admit that I tend to snub my nose at them. But I had this vision of chunky coconut and graham goodness cradling that creamy tartness and I just had to go with it. Let me tell you, this pie, well, it won me over. Big time. There were people at the birthday party thanking me for letting them taste this. LETTING THEM! Ha! So. The crust. it involved toasting some shredded coconut. 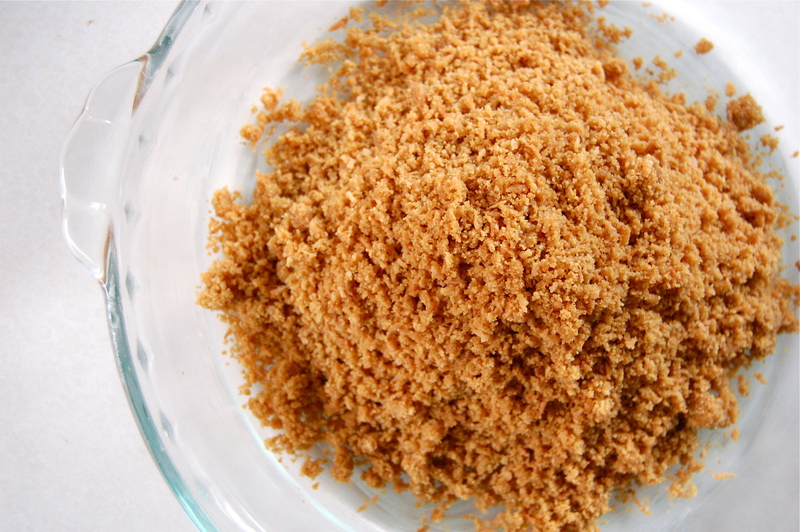 And mixing that coconut in with brown sugar, melted butter and ground up graham crackers (I know, I should have made my own). I pressed that into the pie plate and let it chill in the fridge before baking it. 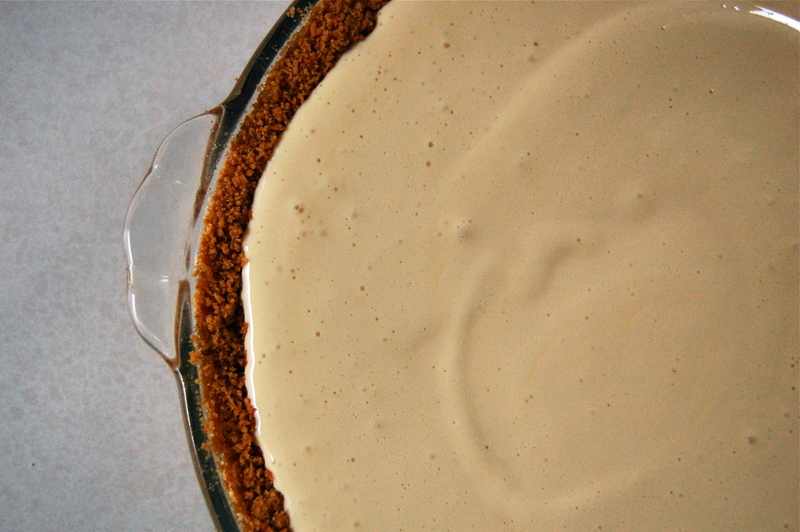 Then I whipped up the classic key lime filling: egg yolks, sweetened condensed milk and key lime juice. I poured that into the cooled pie crust and baked in on low until it set up. 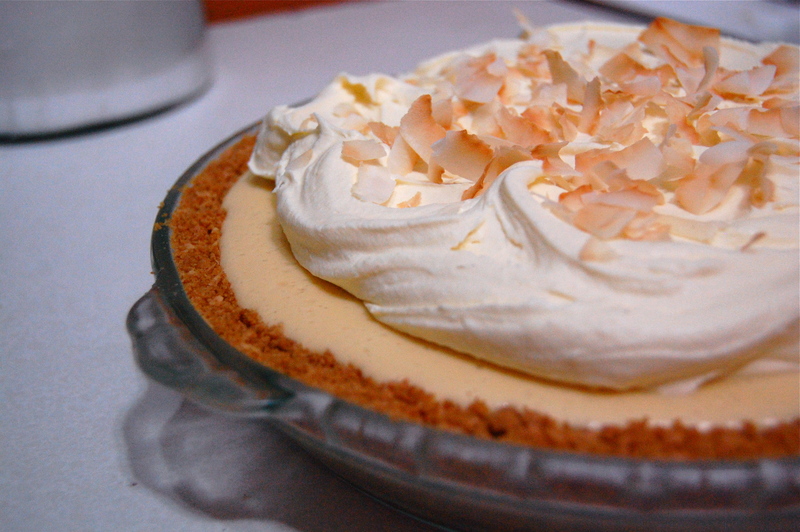 After the pie chilled for an hour or so, I whipped up some cream that I had earlier steeped with coconut flakes. 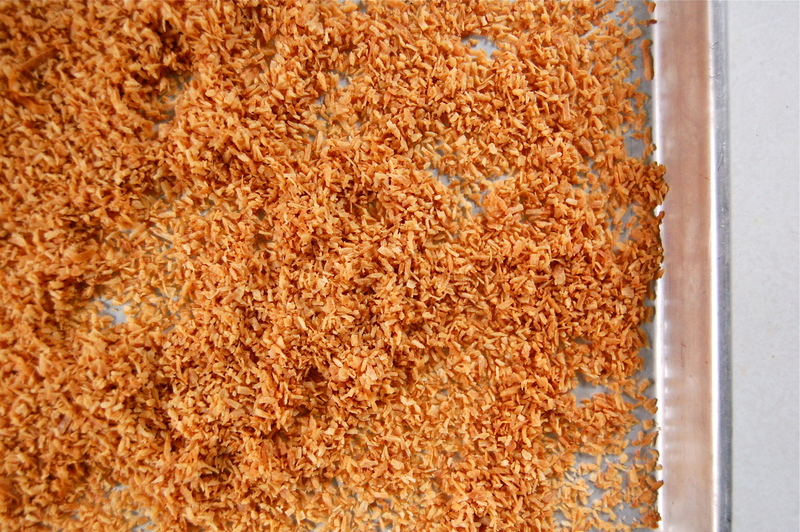 I spread the coconut cream on top and sprinkled on some toasted coconut flakes. And it was promptly devoured at the party. – Toast the coconut until lightly browned. – Cool and add to the rest of the ingredients in a large bowl. Mix well, until everything is moist. – Press into a buttered pie pan and chill for 15 minutes. – Bake in a 325 degree oven for 10 minutes. – In the bowl of a kitchenaid mixer, with the whip the egg yolks until pale and fluffy, about 3 minutes. Gradually add the condensed milk and beat until light and fluffy, 3 more minutes. 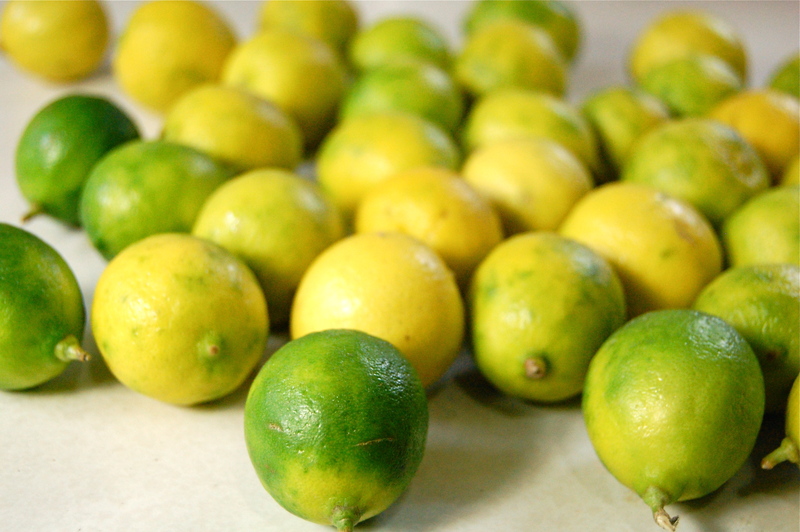 – Scrape down the sides of the bowl and beat in the lime juice. – Pour the filling into the crust and bake for about 10 minutes, or until the filling is set. Remove from oven and place on a wire rack to cool. – Once cooled, place in the fridge until serving time. Just before serving whip the coconut cream. – Place cream and sugar in pot and bring just to boil. – Pour in coconut and cover. Let steep for 1 hour. – Strain out coconut and refrigerate for at least 4 hours.